We believe God has called us to bring the good news to those who work, live and go to school in Winston-Salem. Join us as we seek to be people who do justice, love mercy, and walk humbly with God in this city and beyond. To learn more about opportunities to get involved with the local partnerships below, contact Tim Norton. 1st Pres is very involved in Cook Elementary School, including on-going opportunities and one-time projects where church members can invest in students, parents, and educators. Ways to get involved include being a lunch buddy, supporting a teacher/classroom, and volunteering at the Fall Festival and other projects. From January 1st to March 31st, 2018, 1st Pres will opens its Fellowship Hall as an emergency overflow shelter to provide a safe place for the most vulnerable in our city to get rest and shelter from the cold. To participate and learn more, click here. Our church has a long history of founding and supporting Samaritan Ministries, and continue to support it through donations, volunteers, and 1st Serve projects. We also, every December, staff the overnight volunteers for the entire month! Sign-up coming soon! The Winston Salem Street School provides alternative education to help those who cannot finish high school and prepare for career using traditional educational routes. First Pres supports the Street School financially and with volunteers, and there are many ways to get involved. Crisis Control esponds with financial assistance to residents of Forsyth County who are in serious financial crisis and in need of food, clothing, rent, fuel, medications, utility payment, etc. Email: volunteer@crisiscontrol.org. First Presbyterian has a long-standing history of supporting local mission organizations. Below is a list of local mission organizations we are currently support. Each ministry has a link to their websites and contact information for you to get involved. Please contact us if you would like more information or ways to volunteer. Resettles refugees from around the world in the Triad area. We specifically work with families in Winston Salem. To learn more, contact Tim Norton, 336-723-1621 x235 or check out their website. Provides Christian counseling for personal and family issues, i.e. depression, grief, divorce, etc. Contact Dr. Heath Greene at 896-0065. Provides a backpack of food to a school-aged child in need over the weekend. First Presbyterian currently sponsors 75 backpacks at Diggs-Latham Elementary School. Responds with financial assistance to residents of Forsyth County who are in serious financial crisis and in need of food, clothing, rent, fuel, medications, utilitiy payment, etc. Contact: volunteer@crisiscontrol.org. Ministers to and with Hispanic families in the Old Town area. Mary Bolton, a First Pres Covenant Partner, is the Director, working in partnership with Rosa Miranda, Pastor of El Buen Pastor Church. Volunteers are needed to tutor children, help immigrant families adapt to life in our city, plan special events, help with administrative and creative projects, lead crafts with the women, etc. El Buen Pastor After School Tutoring is 4:00-5:00, Monday – Thursday. Tutors and homework helpers are needed to work with Hispanic students. Spanish not required! To volunteer or find out more contact Mary Bolton. This is an outreach to prisoners in an atmosphere necessary for reconciliation, a fresh beginning, and an end to the cycle of crime. It offers Bible studies, musical services, and counseling for inmates, families, and staff. Tutor an adult in reading, writing and math, and help a fellow neighbor work towards a General Equivalency Diploma (GED). For more information Jone Reid at 759-0063, ext. 37, or email jone@forsythjpm.org. This is an interdenominational homeless Christian ministry started by First Presbyterian Church. This outreach provides hope and healing by sharing food, shelter, and companionship with the hungry and homeless through Christian love and service. We provide nightly shelter for homeless men and a Soup Kitchen serving lunch and supper each day. First Presbyterian Church provides volunteers during the month of December for overnight stay and preparation of two meals. Contact Ron Wixson for more information. Learn more and watch our video! Looking for World Relief Involvement? The global refugee crisis is one that will define the 21st century. We work with World Relief to help refugee families make Winston-Salem home and feel welcomed. First Pres partners with local schools to be a part of the flourishing of our city and loving on our neighborhoods by raising the culture of education so that cycles of poverty and oppression are broken. Research shows that education is the key to helping families take steps out of poverty and away from crime. While teachers and administrators are working hard, First Pres desires to come alongside of them and help schools and students reach their potential. While this probably sounds like a big and daunting thing, we actually think it’s accomplished through small, everyday things that normal people can do. Below is a list of opportunities to get involved with our ministry relationships with Cook Elementary School, El Buen Pastor & Latino Community Services, and the Winston Salem Street School. For more information contact Tim Norton 336-723-1621 x235. Have lunch with the same student each week for a semester. A great way to build into someone’s life. Email Margaret Wray at CookElem@1stPres.com to get involved. Volunteer in the same classroom every week by assisting the teacher as needed. Provide help in Reading or Math. Help teachers & students flourish! Contact janeaves@triad.rr.com to volunteer. Provide snacks for monthly staff meetings; plan special treats for faculty, & provide individual “Bless-A-Teacher” treats. Great way to bless teachers & staff. Contact ljsparling@aol.com to volunteer. 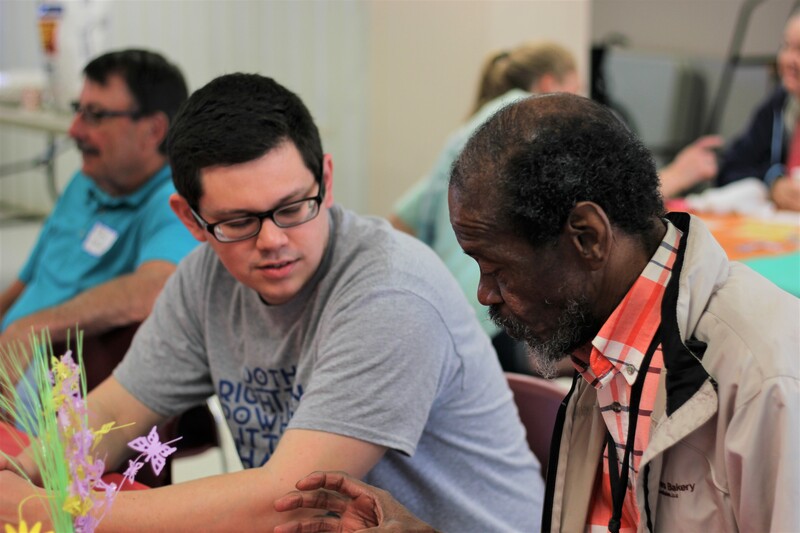 El Buen Pastor and Latino Community Services provides opportunities to mentor students in a local Latino Community. Tutor twice a week for one hour between September and December. There are several other ways to get involved at El Buen Pastor. Groups are responsible for bringing a hot meal, drinks, cups, and flatware for students and staff. A great way to provide hospitality and say thanks for their hard work! Call Camille or Leslie at 721-1110. Spend time helping tutor and/or providing a stable figure in a student’s life to encourage them to reach their potential. Contact w-sss@att.net to learn more about mentoring. Inspire students by sharing your story or explaining how Jesus has impacted your life. No expertise necessary! If interested in volunteering, call Camille or Leslie at 721-1110.